Insulin-like growth factor binding-protein-4 (IGFBP-4) is a member of a famuily of six high-affinity IGF-binding proteins (IGFBP-1 to -6). IGFBP-4, the smallest member of the family is found in all biological fluids with the highest levels in amniotica and follicular fluid. It exists in both non-glycosylated and N-glycosylated forms. It acts as a transport protein for IGF-I and IGF-II and inhibits IGF-induced cellular growth both in vitro and in vivo. The levels of IGFBP-4 are regulated by proteolyis. Pregnancy-associated plasma protein-A has been identified as the major IGFBP-4 protease. The serum levels of IGFP-4 do not change significantly with age. They are increased in ovarian cancer and chronic renal failure. Increased levels of IGFBP-4 have been observed in pregnancies with fetal growth restriction. The biotinylated antibody binds to the streptavidin coated microtiterplate. The IGFBP-4 of the standards/samples binds to this antibody. The biotinylated antibody and the standards/ samples are incubated on the microtiter plate at the same time. After a washing step the bound IGFBP-4, is then detected by a horseradish peroxidase-conjugated anti-IGFBP-4 antibody. After a second washing step the conjugate is added and incubated. The reaction with the substrate is stopped by addition of acid and the blue colour turns to yellow. The measured absorbance is directly proportional to the quantity of IGFBP-4. 2. Biotinylated Antibody: monoclonal antibody to human IGFBP-4 (1 mg/ml) 25 µl. 3. Standard, humanIGFBP-4, 1 µg, lyophilized. 4. Conjugate: horseradish-peroxidase conjugated monoclonal antibody to IGFBP-4 (100 ug/ml, 50 µl. 5. Assaybuffer: 50 ml, ready for use. 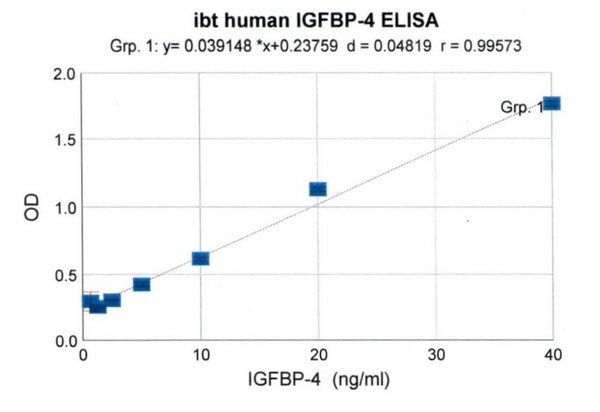 The ibt IGFBP-4 ELISA is for in-vitro research use only! 6.1.2 Reconstitute the standard with 100 µl of the Assay Buffer. The reconstituted standard is stable for at least 2 weeks at 4 °C or for 1 month at -20 °C. Avoid repeated freeze-thaw cycles. 6.1.5 Prepare the required amount of washing buffer by dilution of 1 volume of the concentrated washing buffer with 9 volumes of distilled or demineralized water. Use within one week. 6.1.6 Sera: In normal sera a dilution of 1 + 9 is recommended. Standard 7 (0.625 ng/ml): Mix 500 µl Standard 6 with 500 µl Assaybuffer. 6.3.1 Dispense 100 µl of Assaybuffer in Well A1 and A2 (Blank) of the microtiter plate (Blank). Incubate for one hour at room temperature (22-25 °C). 6.3.3 Dispense 100 µl conjugate working solution per well and incubate for one hour at room temperature. 6.3.5 Dispense 100 µl substrate solution per well. To minimize imprecision, this should be done by a multichannel pipette or in timed intervals. Incubate for 15 minutes at room temperature. 6.3.6 Stop reaction by adding 100 µl of stop solution to each well. To minimize imprecision, this should be done by a multichannel pipette or in timed intervals as in step 6.3.5. The blue colour will turn yellow upon addition of the stop solution. 6.3.7 Measure the absorbance of each well at 450 nm (reference 650 nm). 1.) Van Doom et al. : Plasma levels of insulin-like growth factor binding protein-4 (IGFBP-4) under normal and pathological conditions. Clin Endocrinol (Oxf). 2001 May;54(5):655-64. 2. )Zhou et al. : IGF-binding protein-4: biochemical characteristics and functional consequences. Journal of Endocrinology (2003) 178, 177–193. 3. )Mazerbourg et al. : Up date on IGFBP-4: regulation of IGFBP-4 levels and functions, in vitro and in vivo. Growth Horm IGF Res. 2004 Apr;14(2):71-84.